We wake up late today since my office work was scheduled for the second half of the day. So I decided to go for brunch and a light meal after that instead of having a full breakfast. 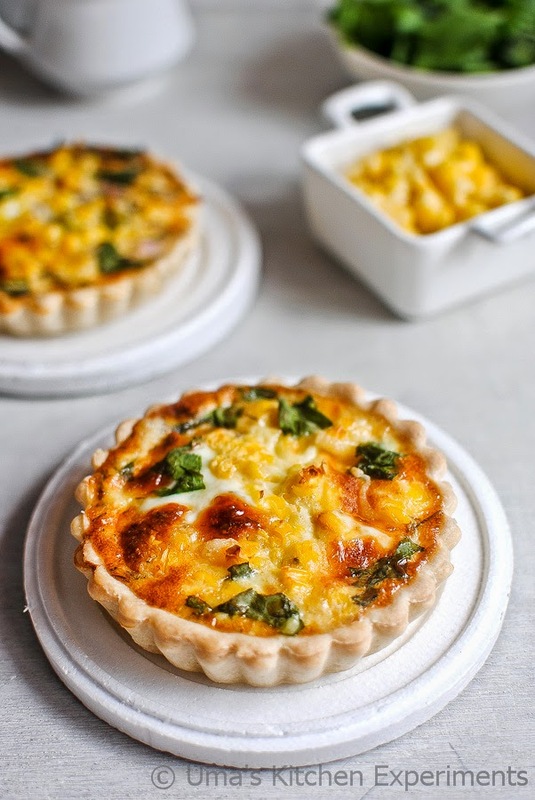 I was having the shortcrust pastry in my fridge and decided to make quiche out of it. Made use of corn that I bought for baking the bread, so that I can also link this to the contest. This is my second entry to the IFBM and Freedom Tree Baking Contest. 1) In a mixing bowl take all-purpose-flour. Add salt and mix well. 2) Add cold butter. Use your fingertips to rub the butter into the flour till you get a mixture that looks like bread crumbs. There should not be large butter lumps remaining. 3) Slowly add water and make a dough. 4) Wrap it using a cling wrap. Keep inside the refrigerator at least for 30 minutes. 5) Meanwhile, prepare for the filling. 1) Break eggs in a small bowl and beat well. 2) Add 2/3 cups of milk. 3) Add pepper salt and dried herbs. Beat well and keep aside. 4) Keep everything ready and arrange them. 1) Take the dough out from the refrigerator. Roll the cold pastry on a floured kitchen surface until 1/8 inch thick. 2) Place this rolled pastry on to a mini tarts and shape them as shown in the picture. Make sure the pastry is sticking with the pan well. 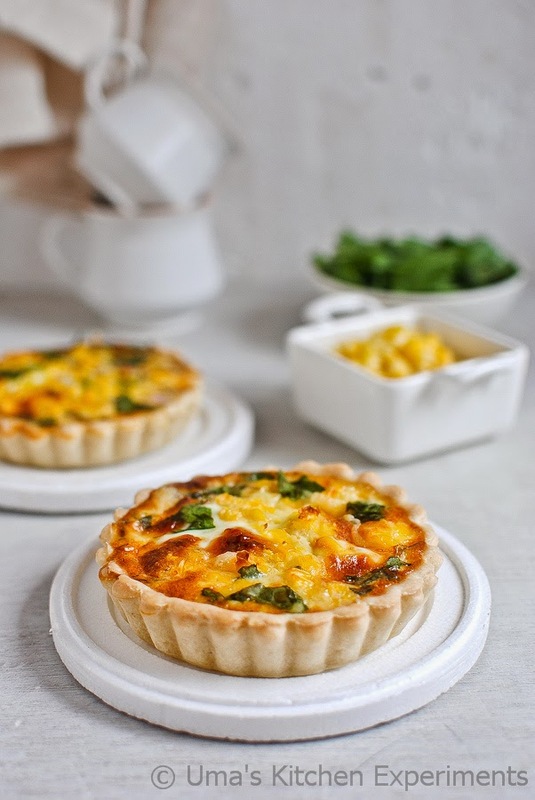 At the same time, do not stretch the pastry to fit the edges of the tart pan. If you do, it will shrink back when it is baked. 3) Preheat the oven to 350F/175C for 15 minutes. 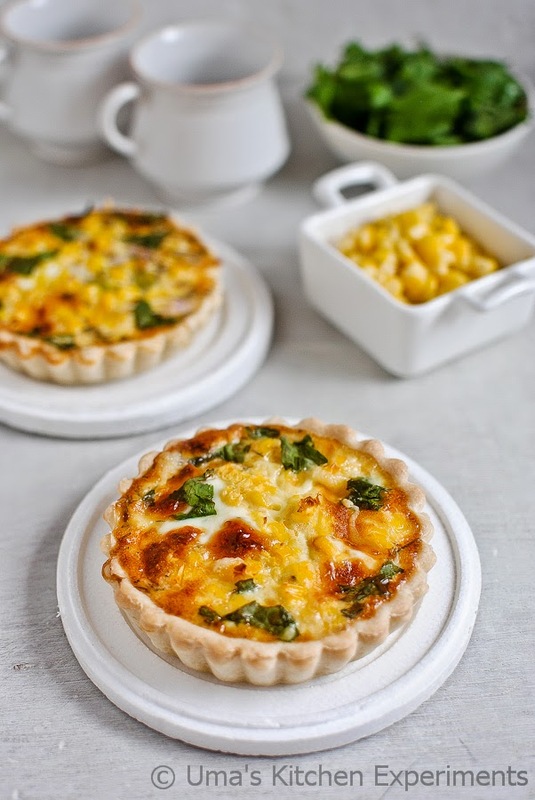 4) Layer the tarts with finely chopped spinach first. Sprinkle grated cheese then. Make sure there is no gap. 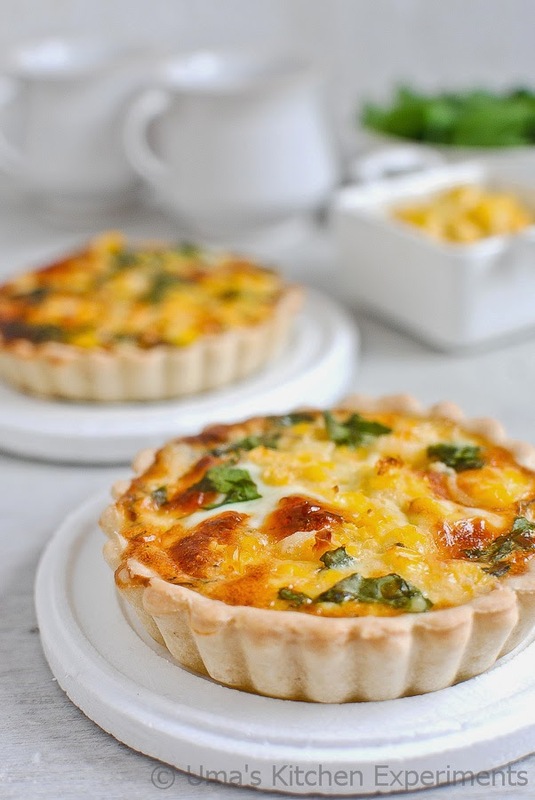 5) Spread the corn and pour the custard over the tarts after mixing the filling well again. 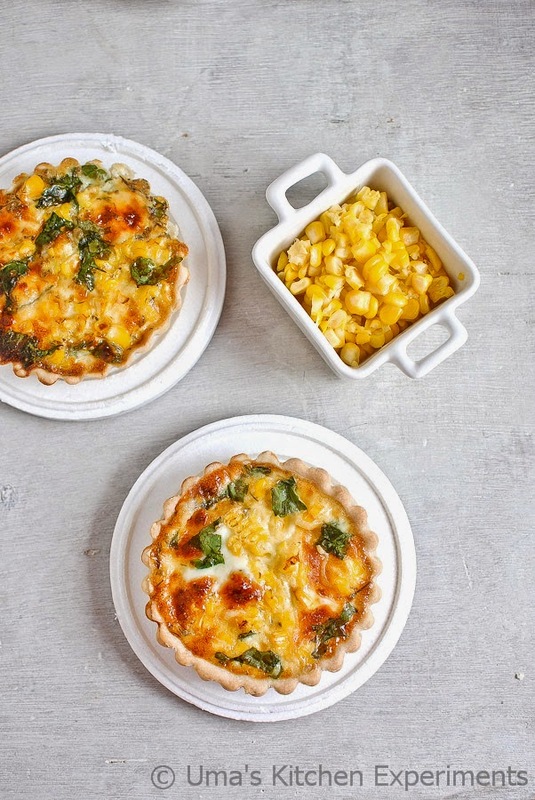 Top it again with few corns and chopped spinach. 6) Bake it for 45 minutes or till the knife inserted into the center of the tart pan comes out clean. Sometimes, it takes an hour and again it depends upon the oven. It will puff nicely and the crust become golden at the end of baking. 7) Wait for few more minutes and serve warm. 1) Instead of milk you can use cream for making the custard. 2) you can also use 3 eggs + 1/3 cup of milk instead of the measurement given above in the recipe. 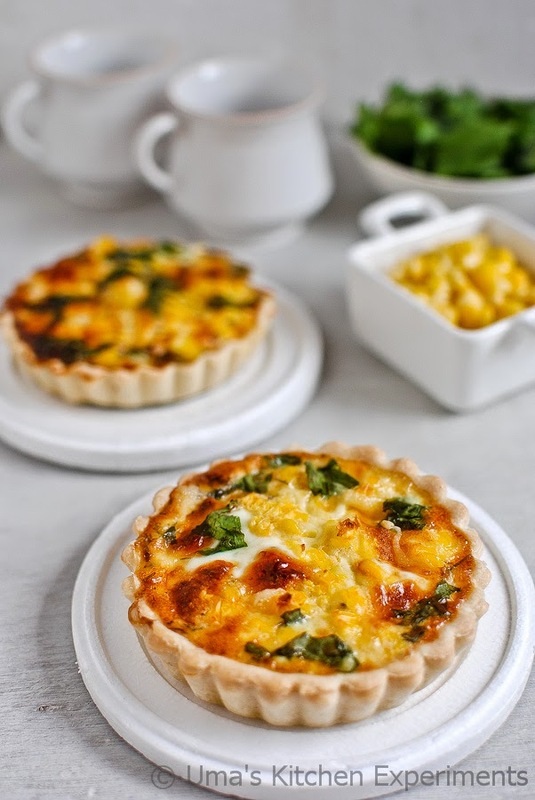 3) Cheese is used to avoid soggy crust while baking. 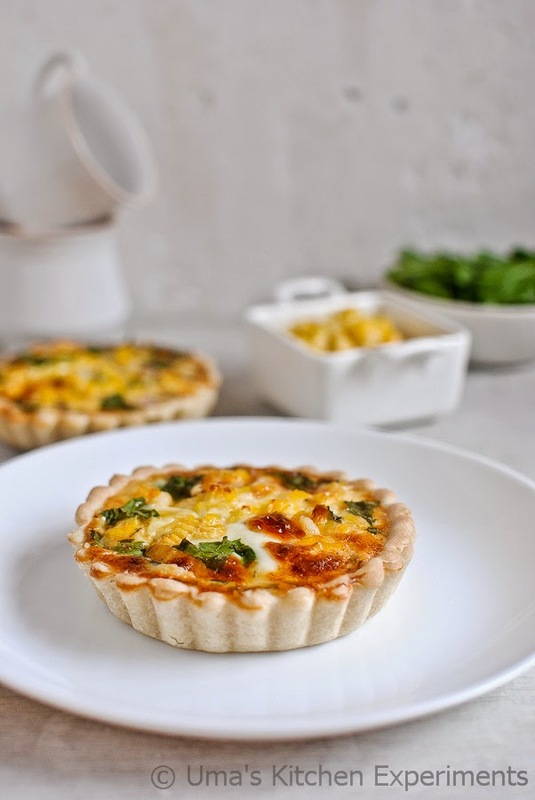 Try to use cheddar cheese for best resulted quiche. However, If you don't avail it in your place of stay, then substitute it with any other cheese. Wholesome and lovely looking quichie. Excellent preparation.